Forbes Field (also known as the Topeka Army Airfield and later as Forbes Air Force Base during DOD use) consisted of 4,233 acres. Forbes Field is located approximately 3 miles south of Topeka, Kansas in Shawnee County. The site is east of and adjacent to Highway 75. Forbes Field is an active municipal airport operated by the Topeka Airport Authority. The former administrative area is now used for commercial offices, state offices, and an industrial park. The Kansas Air National Guard also uses a portion of the site. Most of the site is developed, but there are portions of the site (south and east of the main runway) that are heavily wooded and undeveloped. Congress authorized the Topeka Army Air Field (TAAF) building project within two weeks after the Dec. 7, 1941, attack on Pearl Harbor. Eight months later, the completed air base -- essential buildings, hangars, repair shops, steam heating plants, fuel storage and three 7,000 by 150-foot paved runways -- was formally accepted by the Army Air Corps. In August 1942 the first troops arrived and had to be quartered in the agriculture building on the Topeka Fair Grounds because their green wood two-story barracks buildings weren't finished yet. By September 1942, the field was the home of the 333rd Bombardment Group. By 1945 TAAF was one of three B-29 centers where newly transitioned crews claimed new Superfortresses and took off for the Pacific to aid in the assault on the Japanese home islands. On 31 October 1947 Topeka Army Air Field was inactivated. During World War II there were ammunition storage bunkers and small arms ranges. These features were removed during construction of the new runway. New ammunition storage bunkers and ordnance storage warehouses were constructed. The bunkers are currently being leased to a company for storage of explosives and are locked. The ordnance storage warehouses are being used by the airport authority for storage. There is an area south of the bunkers that is suspected of being a burial site for rocket fuel and munitions. On 01 July 1948 Topeka Army Air Field reactivated as a Strategic Air Command base (SAC); home to the 311th Air Division, Reconnaissance, and to the 55th Strategic Reconnaissance Wing. That mission continued until 14 October 1949, when the base was again inactivated. During that activation, TAAF was renamed Forbes Air Force Base in memory of Maj. Daniel H. Forbes, a Topeka pilot killed June 5, 1948, while testing the Northrop XB-49 "Flying Wing" jet bomber near Muroc Dry Lake, CA. During the Korean War, Forbes AFB reopened and was again assigned to SAC. on 16 February 1951 the 21st Air Division was activated at Forbes, and the division's 90th Bombardment Wing moved to the base in February and March. The wing trained SAC's newly activated 376th, 308th and 310th Bomb Wings. From June 1951 to August 1953 it also trained B-29 replacement crews for combat. About 10 a month were trained until August 1952 when the bomb wing training program was concluded and the number of B-29 crews produced was doubled. On 16 June 1952 the 90th was redesignated the 90th Strategic Reconnaissance Wing, Medium, and five months later started training recon crews as replacements for Far East Air Forces. During October 1952 the 55th Strategic Reconnaissance Wing moved to Forbes from Ramey AFB, Puerto Rico, continuing its program of photography, photomapping and electronic reconnaissance. In June 1960 the 90th SRW was deactivated and replaced by the 40th Bomb Wing, transferred from Schilling AFB, Salina. The 40th was there until 1964 and it flew the B-47. The Tactical Air Command began operation of the base in 1965. In October 1958, Topeka received news that Forbes AFB would support Atlas E missile sites to be constructed in the surrounding area. The Corps of Engineers Kansas City District managed construction of the nine �coffins� where the missiles would be stored horizontally. Although Forbes was slated to have three sites with three missiles at each site, in February 1959, the Air Force directed that each missile be placed at an individual launch site, These sites were situated at or near Valley Falls, Dover, Waverly, Osage City, Delia, Wamego, Overbrook, Holton, and Bushong. Construction officially began on June 9,1959, when Kansas Governor George Docking drove a silver nail into a construction form. Labor-management problems caused occasional setbacks in construction. During the project there were 22 work stoppages, most of which were quickly resolved. However, in October and November 1960, a long work stoppage occurred due to a work assignment dispute between the hoisting engineers and the electrical workers. The problem was resolved after the National Labor Relations Board issued a restraining order. There were 25 lost-time accidents during construction, including two fatalities that were electricity-related. One minor disturbance occurred at one of the sites when student pickets from McPherson College arrived to protest the deployment of ICBMs. Despite the labor problems and student pickets, the project continued on schedule. On July 1, 1960, the 548th Strategic Missile Squadron stood up. Nearly 6 months later, on January 24, 1961, the first Atlas missile arrived at Forbes. By October, all nine sites had their Atlas E missiles. The Forbes sites were completed 3 weeks ahead of schedule. On October 16, 1961, Air Force Ballistic Missile Activation Chief, Maj. Gen. Gerrity turned over operational control of the sites to Second Air Force Commander Lt. Gen. John D. Ryan. In the ensuing press conference the two generals urged Kansans to become interested in constructing fallout shelters as an insurance policy that could enhance deterrence. As a result of Secretary of Defense Robert McNamara�s May 1964 directive accelerating the decommissioning of Atlas and Titan I missile bases. The 40th Bomb Wing was discontinued and inactivated September 1, 1964. The 548th Strategic Missile Squadron was deactivated on March 25, 1965. Forbes became a Tactical Air Command facility , but was closed by the Department of Defense in 1973. Improvements included runways, hangars, barracks, administrative and support structures and facilities. The site was disposed of in a series of transactions from 1945 to 1986. In January, 1974, the Metropolitan Topeka Airport Authority was created by Topeka City Charter Ordinance to oversee the transition period, the title for most of the 3100-acre facility was transferred to the City of Topeka in April of 1976. Title was transferred to the city, less the Air Guard enclave on the northern third of the 6,000-foot north-south ramp, a portion of the south ramp and four associated buildings reserved for the Kansas Army National Guard. Commercial air service was moved to Forbes in May of 1976 and a month later Frontier Airlines initiated the first-ever jet service to Topeka. In November, 1978, Shawnee County voters approved legislation making the Metropolitan Topeka Airport Authority an autonomous agency working under state statutes. Taxing authority was established by KSA 27-333, which calls for 1.85 mills per year of county taxes. County voters turned down a bond issue for a new air terminal in 1981 but passed the issue a year later. The new five million dollar terminal was opened in 1985. Currently US Airways serves the community. In addition, the new air terminal has one rental car agency. 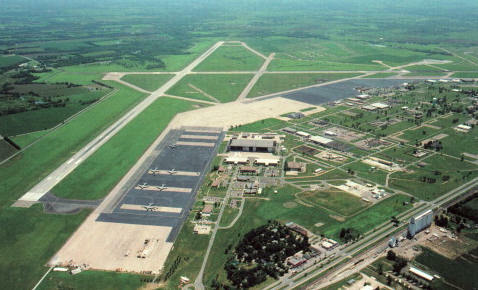 The Metropolitan Topeka Airport Authority's responsibilities also include Philip Billard Airport, a general aviation facility Northeast of Topeka; the Topeka Air Industrial Park, the former Forbes Cantonment Area; and Forbes Field. The Industrial Park has undergone considerable renovation. Over 90% of the original wooden structures have been removed and the area cleaned up. Many of the remaining buildings are being rehabilitated. Over fifteen million dollars have gone into the two airports. Improvements have been made to all taxiways and runways at both Billard and Forbes. Although considerable progress has been made, plans call for even more renovation and construction to continue operating and developing the community's airport system. Air carrier operations were moved from Philip Billard Municipal Airport to Forbes Field, and jet service was initiated there June 1, 1976. The field has an 8,000- by 150-foot and a 12,800- by 200-foot runway, both maintained to a high standard by Defense Department funds, plus a 100-acre parking apron and relatively moderate traffic level. The 190th Air Refueling Wing (ARW) of the Kansas Air National Guard (KANG) occupies 215 acres on the south side of Topeka Airport, located approximately 5 miles south of downtown Topeka, Kansas. The mission of the 190th ARW is to �Provide a professional trained militia, ready to serve community, state and nation�. The unit currently flies the KC-135E/D Stratotanker. The 190th ARW occupies 7 administrative facilities, 16 industrial facilities, and 2 services facilities totaling approximately 523,100 square feet with 323 full time personnel. Unit training drills conducted once a month result in a surge of up to a total of 1152 personnel.